If you’ve got a coffin that’s looking for a little something extra then consider adding a slow rotating wiper motor to it. Eerie Acres Cemetery has a video tutorial on how he built his and it turned out great. The wiper motor spins at the perfect speed so that it doesn’t look obnoxious and you don’t even notice the wooden wheel that’s lifting the coffin lid. This is a great effect, and there’s really not much needed to get it done. 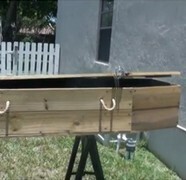 In fact, building the coffin takes more skill than animating it does.